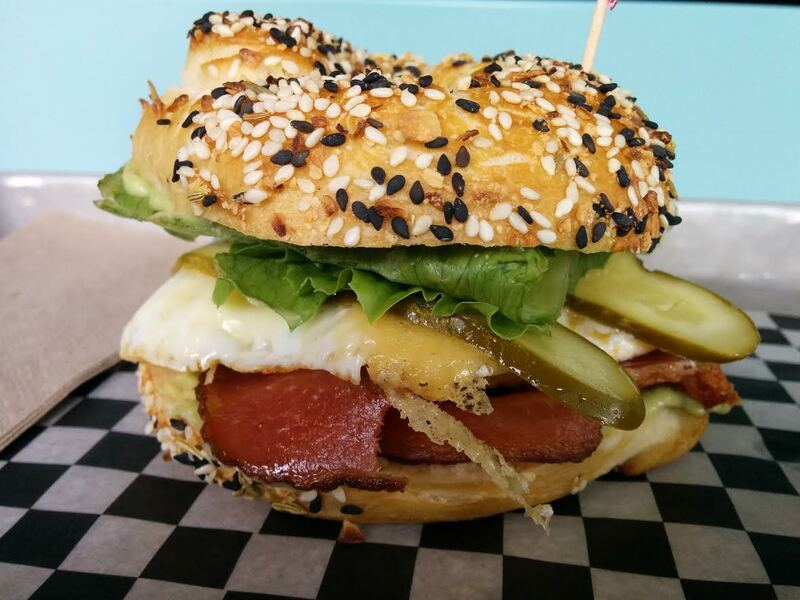 If you haven’t been to The Canteen, sandwich lover, you’re really missing out. This brainchild of Fiesty Chef, Renée Lavallée, is most coveted by those across the harbour. Hidden above Two If By Sea, on Dartmouth’s Ochterloney Street (and soon moving to Portland St), this is arguably the best place for sandwiches on the east coast. The menu rotates daily so you’re best to check it out here and to arrive early; items are known to shamelessly run out as early as 1pm. On Saturdays (open 9am-3pm) there is a brunch theme, with breakfast pizza and frittata making the roster. Weekdays feature, in addition to sandwiches, daily take-home meals available from 4:30pm-6:30pm. Stuff like roast chicken dinners and mac ‘n cheese. I’ve covered The Crobster and The Big Fish on my Best Lobster Rolls post, but this is the first time The Canteen has been featured on a Sandwich Showcase. I decided to showcase a regular Saturday fixture. 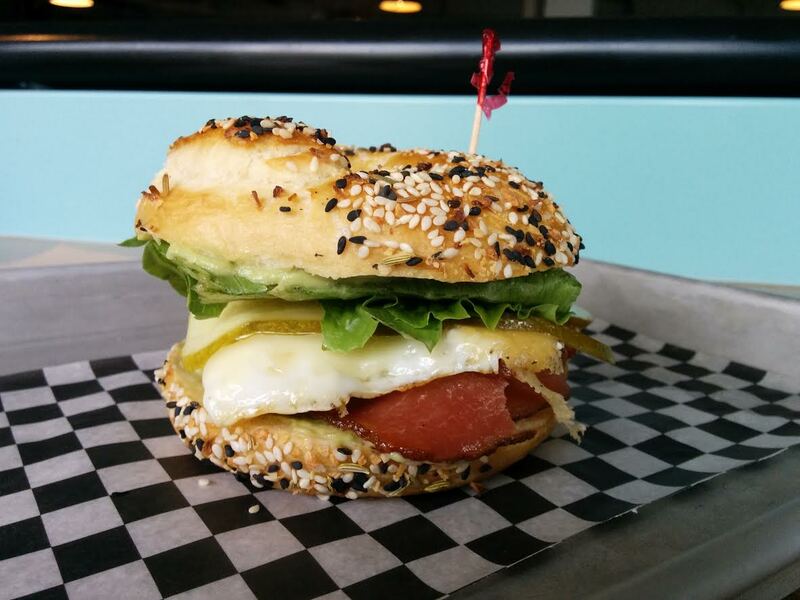 The Dartmouth Hangover ($9.75): Fried egg with avocado cream, Oulton’s double smoked bacon, pickles, white cheddar and greens on a house-made everything bagel. What a glorious sandwich! The bacon was robust and meaty – not the fatty bacon that is prone to being under/over-cooked. It was supported by the sharp cheddar, creamy avocado and the tangy crunch of the pickles; I loved the interplay of the ingredients! The egg was inexplicably tasty – like, an egg is an egg is an egg, right? Wrong?! This egg was somehow more. The yolk was set, which I liked. I think a runny yoke may have been too much for the soft bagel. This was the softest bagel I’ve ever had (almost croissant-like) but it managed to hold the ingredients without falling apart. It was topped with sesame and fennel seeds, the latter contributing bursts of flavour that really elevated this sandwich from damn good to right some freakin’ great!! The bagel may have been the star of the show, but I can’t decide because everything was so good. There’s a reason The Canteen has such a strong following. They continuously bang out fantastic, creative sandwiches on homemade breads – everything from tuna melts to fried chicken po’boys. If you didn’t know, now you know. Can you believe I have not been there yet? What is wrong with me? I have heard great things about this place and never remember to go. I put iton the list right now.